I thought that I would explain how we all became the Dionne Quiltuplets. My mother, Lise, was the first mentor to my two sisters and me (Suzanne, Michèle and Natalie). We all learned to sew when we were young; we were often found making dresses, shirts, shorts, jackets, prom dresses and in the end our wedding dresses etc. When we turned 20, we all received our own sewing machines. My first sewing machine was a Singer. It did not do many fancy stitches but it would sew and sew. And as usual, life carried on. Suzanne had a son, Michèle had three children and Natalie had two. I, Michèle, have two girls who also love to sew and a son who knows how to use the sewing machine. And at 20, my two girls received their first sewing machines. Quilting came to us later on. 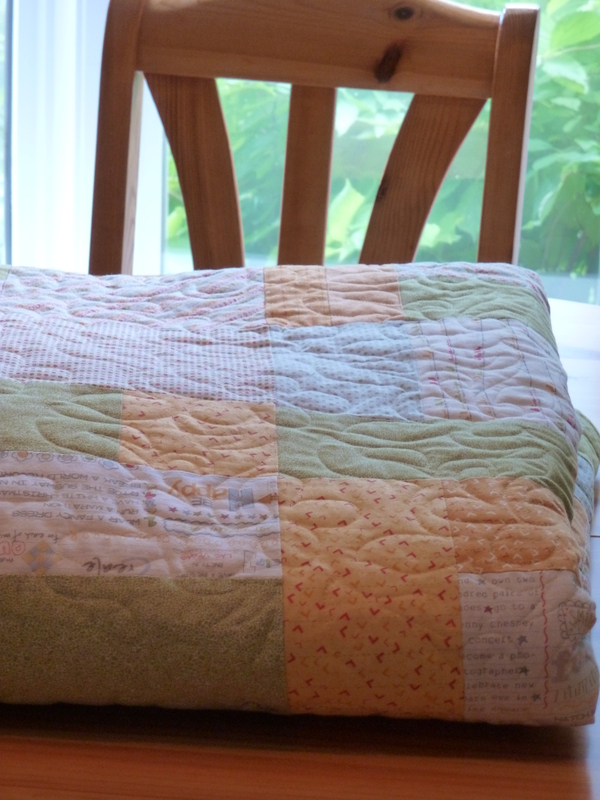 Baby quilts were made at the birth of Natalie’s two children. It was great to get together to work on a project. But the real love of quilting began a few years ago. My father, a wonderful compassionate man, was in the last years of his struggle with Parkinson’s. When he was in a nursing home, my mother and the three girls would visit him often. As we all know, taking care of someone you love means there is not much time left to be with the others you love. And so our monthly get-togethers to sew began as a way to support each other and do what gave us life and excitement. My father has since passed away, but we still get together. Our group now includes Lise, Suzanne, Michele, Natalie, Michèle’s two daughters, Emily and Stéphanie and Natalie’s son Jérémie. We can’t all be there, but at times, train trips home have been rescheduled to not miss the “sewing day”. Sometimes, we talk more than we sew, but our “sewing day” always brings us together and gets us strength. During the last 2 years, we had two new beginnings. Emily began the Dionne Quiltuplets blog. Thank you very much Emily; you have done a great job. The second acquisition is a long arm machine. With the six of us and then one more, we figured out the cost of having others machine-quilt our quilts was more in the long run that owning our own long arm machine. Last July, a Handiquilter long-arm machine was installed in Lise’s basement. A big thanks to my mother for the joy that it has brought and will bring. My father, who always encouraged our activities, would have loved to see us enjoy our time together. 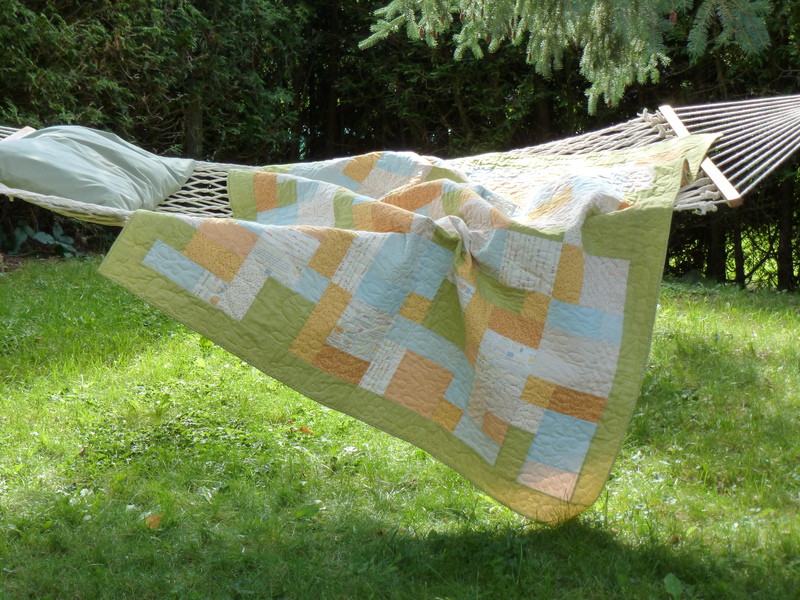 The first quilt that I present is the first quilt that came off our long-arm machine (which has yet to be named). 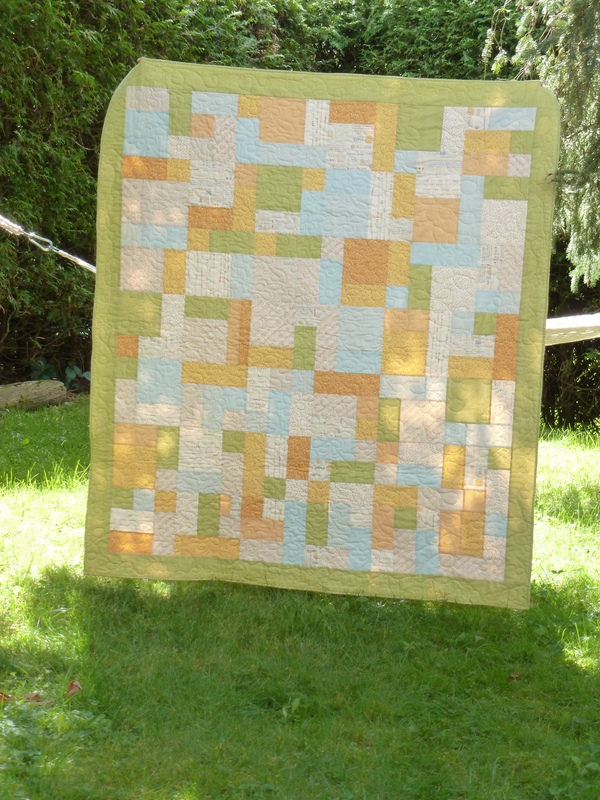 I patched the top of the quilt using the Yellow Brick Road pattern and fabrics from the “Noteworthy” design. Lise, Natalie and I all had a hand in the machine quilting. And when we were done, we all danced!! I called this quilt “Creation” because for me, after the dark days of missing my father, I felt alive creating something. From my faith background, I love that God calls us to create beauty. Although this is not the most stunning quilt you will see, to me, it has been created with love, healing and the most fond memories of my dad and friend.